Waheguru Ji Ka Khalsa Waheguru Ji Ki Fateh. Hukamnama today is by Guru Arjan Dev Ji Maharaj, on Ang 742 of Sri Guru Granth Sahib Ji in Soohee Raag. baikunth is a name that has been given to heavens but in this case it actually means where Waheguru Ji abides. And let’s not get that confused with heaven because Satguru Paadshah Ji Maharaj is saying in this Shabad’s line tuk – jahaa wherever the Sant; wherever the people and Sant is made of three things; the sassa is telling us those people who do Simran and who remember God; the tippi gives an “n” sound, which is telling us those people who have nimarta - humility and the tatta is telling us tapasya - it means those people who carry out sayva - service. Those people who have Simran, those people who have humility and those people who have service they are saints. And Maharaj Ji says wherever they have vaasaa they live, that nagar - that city, that town, that place becomes baikunth. It becomes the town of God, it becomes the city of God. 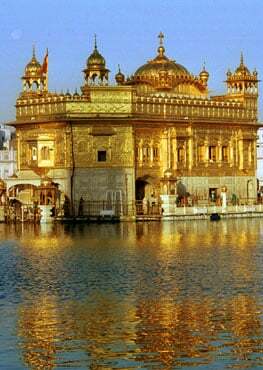 Wherever those people who love God abide, God lives in those people who love and meditate upon Waheguru. Maharaj Ji says why does Waheguru Ji abide in that city, why does Waheguru Ji abide within them. Because they have enshrined the charan kamal - the lotus feet of parabh(u), of Waheguru within theirrid - within their heart. The day Waheguru Ji comes and dwells inside the heart of a saint, that is the day wherever that saint goes, whichever place he or she puts his feet in, that place becomes blessed. It is such a beautiful thing, Guru Arjan Dev Ji Maharaj Ji is saying today. Maharaj Ji is saying sun man tan tujh sukh dikhlaava-o listen O human being, let me show you the way that you can find peace within your mind and within your body. tujh sukh dikhlaava-o I want to show you the path of peace. har anik binjan tujh bhog bhunchaava You have been eating the tastes of the world all your life but I want you to enjoy the taste of God’s love which tastes like anik binjan. anik binjan means countless tastes. The taste of God’s love cannot be described, its beyond all the tastes of the world, that is what I want you to eat. bhog bhunchaava I want you to eat that and bhunchaava has been interpreted to also mean to digest it and I want you to take that sweetness of God’s name within your body. rahaa-o Guru Ji says pause and think about this. I want you to taste the name of the God, which tastes like immortal nectar within your mind. Thesaad - taste of God’s name is beyond words, it is so wonderful. taa kay barnay na jaahee - it cannot be described. Instead of tasting the false tastes of the world, taste the true taste of God’s love. And what happens when you taste something in the world, you get greedy, and you want to taste it again. When you taste something in the world it fills you with greed, but when you taste God’s love, lobh Moo-aa - when you taste name of God by meditating upon God, your lobh - your greed dies. tarisnaa bujh thaakee - your greed andtarisnaa means your thirst for more, inside both of these things die. bujh literally means to go out, like candle blows out; thaakhee means to be tired. You no longer run after anything, your greed and all of these things die. For those people, who have seeked; taakee literally means to seek, saran - to seek protection. Those humble people, thosejan who are going for protection of God, who tastes the taste of God’s love, their greed and their running around after the world dies. They no longer have that within them. And another blessing – the attachment and the fear which a person carries around for many janam janam - for many lifetimes, nivaaray they are also removed. Maharaj Ji says the Waheguru himself has blessed this daas - blessed this servant with his kirpaa - with his grace.